Grind the walnuts as finely as possible in a food processor until they have the consistency of peanut butter and the walnut crumbs are starting to stick together like a dough. Transfer the ground walnuts into a large, lidded casserole dish and pour over 1 litre/1¾ pints of the cold water. Bring the mixture to the boil for 4–5 minutes, then reduce the heat until the mixture is simmering. Simmer the walnut mixture, half-covered with the casserole lid, for 2 hours, adding the remaining 200ml/7fl oz of cold water and 2 ice cubesafter an hour. Stir occasionally throughout to make sure the walnuts don’t stick to the bottom of the casserole. After 2 hours, the walnut sauce should have thickened and darkened in colour. Stir in the pomegranate molasses, tomato purée, cinnamon, sugar, salt and pepper until well combined. Return the mixture to a simmer. Add the chicken thighs, return the mixture to a simmer, then place the lid on the dish and cook gently over a low heat for 1 hour. Remove the lid for the last 10 minutes of cooking to allow the sauce to thicken. Season, to taste, with more sugar (for sweet) or pomegranate molasses (for sour). 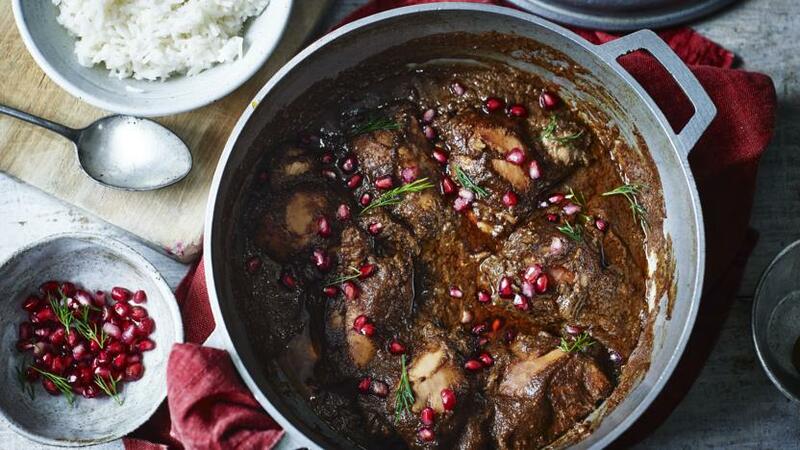 Garnish the dish with a handful of pomegranate seeds, if using, and serve with steamed rice.